Welcome to KristaFracke.com, your online source for real estate in Northeast Florida. Based out of beautiful Ponte Vedra Beach, Engel & Volkers Jacksonsville Beach is an international firm serving a number of areas including Jacksonville, Ponte Vedra Beach, eTown Edison homes for sale and eTown Marconi homes for sale. We also specialize in communities in the counties of St. Johns, Duval, and Clay. Whether you’re relocating, shopping for a vacation home, or thinking of putting your current home on the market, our website is designed to help you reach all of your real estate goals. Access exclusive search tools and local neighborhood guides in addition to all available home listings on the MLS® (Multiple Listing Service). Get personalized service from one the top brokers in Florida, with years of experience and over $190,000,000 in sales. Ready to go? Start your custom search now, or browse listings by community below. For condominiums or townhomes, head to our Ponte Vedra Beach Condo Page. Ponte Vedra Beach real estate is in St. John’s County, offers upscale living in Northeast Florida. Lush golf courses, pro-tennis courts, and a top-notch school system make homes in Ponte Vedra Beach among the most valuable real estate in the North East Florida. Prices reflect the high demand, as most residences are priced well into the millions. In fact, many people relocating to our area start out looking for Jacksonville Real Estate but just fall in love with the neighborhoods of Ponte Vedra Beach. Residents are drawn to look at Ponte Vedra Beach real estate in part due to the community’s love of golf. The ATP Tour, PGA Tour, and The Player’s Championship are all played at the Tournament Players Club at Sawgrass Village. Three neighborhoods famous for golf in Ponte Vedra are Sawgrass, Marsh Landing, and The Plantation. The exclusive Ponte Vedra Inn and Club also offers tennis, golf, and sailing, just to name a few, for outdoor enthusiasts. The homes on the beach along Ponte Vedra Boulevard are some of highest priced homes in North East Florida. The scarcity of oceanfront lots in the area has driven up home prices to the $10,000,000 mark. Buyers trying to build an estate home on the Boulevard can have a hard time finding 200 foot wide lots these days. The lack of inventory has led to buyers finding older homes they can tear down to rebuild with new modern beach homes. The effort is worth it for a home on some of the most private, peaceful beaches in Florida. Another marquee area for finding an exquisite estate homes is Harbour Island at Marsh Landing Country Club. This gated neighborhood is located on the Intracoastal waterway and has boat slips that accommodate some very large yachts. The Harbor Island location of Marsh Landing is secluded and developed to blend in with natural marsh and waterways around it. There are homes in this area worth more than $6,000,000. If you are considering purchasing a vacation condo or an investment condominium, Ponte Vedra Beach Condos are an excellent opportunity. 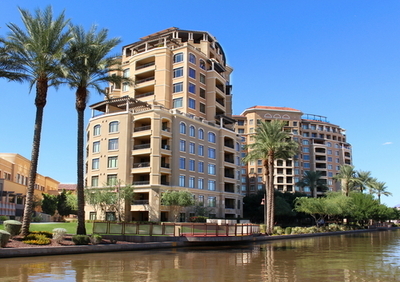 These condos make really great 1031 exchanges. There are also plenty of Jacksonville Condos and Jacksonville Townhouses available just a short drive to the areas beaches and downtown Jacksonville. Of course everyone wants to look at oceanfront homes in Ponte Vedra Beach, but with lots and teardown homes starting at $5,000,000 on the ocean, many buyers look at the nearby oceanfront Jacksonville Beach condo market. There are several options for modern, oceanfront, luxury condos Jacksonville Beach condo developments. Not only can residents enjoy the pristine, quiet beaches, near their Ponte Vedra Beach Homes, but they can also enjoy the natural beauty of Guana River State Park, a barrier island located between the Atlantic Ocean and the Tolomato River. With over 2,400 acres of beaches, sand dunes, tidal creeks, and salt marshes, the park provides a serene afternoon escape. Many homes for sale in Ponte Vedra Beach have the added bonus of sitting atop these sand dunes, allowing for absolutely breathtaking views of the Atlantic Ocean’s gorgeous sunrises. There are many beautiful neighborhoods throughout Ponte Vedra Beach like Montura, a smaller gated community built by Authur Rutenberg Homes to large golf communities like Sawgrass featuring The Players Championship Golf Course. The community’s close proximity to neighboring Jacksonville allows residents to retreat to a small, upscale community after a short commute from work. Plus with The Mayo Clinic and Shands Hospital just a short distance, people looking for Ponte Vedra Beach homes for sale find everything they need within the community or just a short drive to top medical care facilities. Professional golf and tennis, untouched beaches, and a superior public school system make Ponte Vedra Beach the perfect place to live, with the added bonus of a beach resort feel! This data up-to-date as of April 21st, 2019 at 12:53pm EDT. For the most current information, contact Engel & Volkers Jacksonsville Beach, 904.998.8277, krista@kristafracke.com.